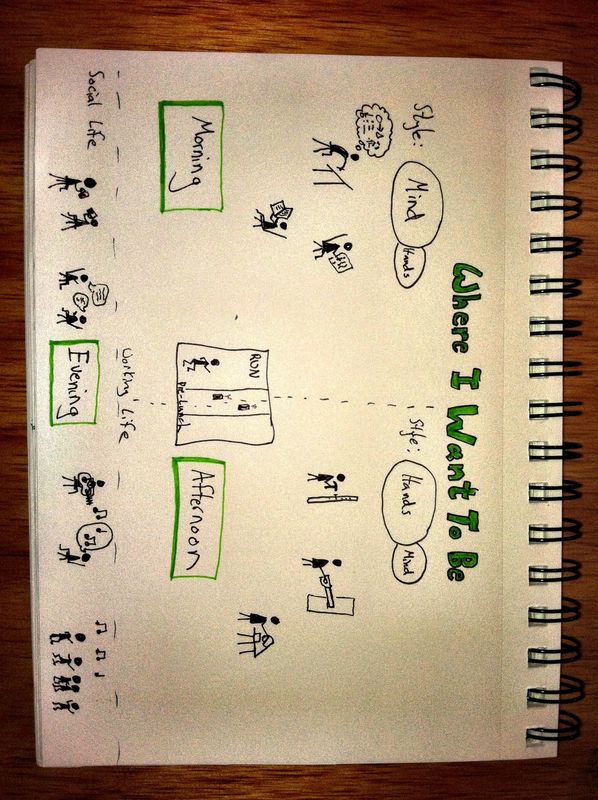 As you can see from the sketch, I was (and still am) looking for balance in my life – the right combination of work and play, and the right amount of variation within each of those. With the desired new reality in place, the next step is to act on it. The first step toward making that desired future a reality was starting this site. And now, with each new sketch that I post and skill that I develop, I can feel myself getting closer to that goal. 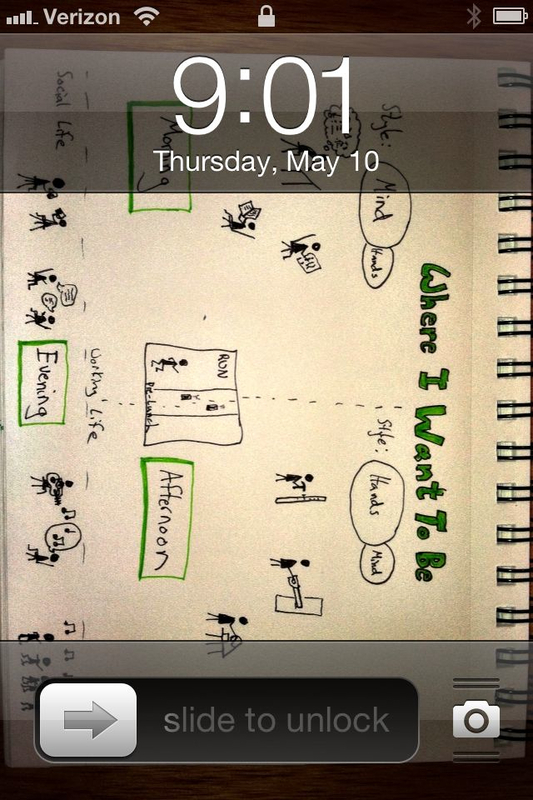 In order to have that goal present in my thoughts throughout the day, I posted my sketch as the lock screen wallpaper on my iPhone. 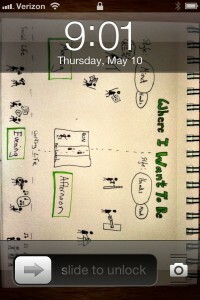 Now, every time I unlock my phone I’m reminded of what I’m working toward. Since originally creating the sketch above, my goals have shifted slightly, but the core components are still there. I think that it’s worthwhile to reevaluate the sketch that you have drawn for yourself from time to time and update it to reflect new circumstances, new perspective, and new life goals. How has my picture changed? More connections with others during the morning and afternoon parts of my day. In many ways I am an introvert, and do my best work alone, but I also recognize my own need for connectedness in the work that I do. I hope to achieve that connectedness via involvement in my local community (suggestions for events to sketchnote in Portland? Let me know!) as well as via the online community which I am beginning to get to know, thanks in part to this blog. So tell me, what does your future look like? 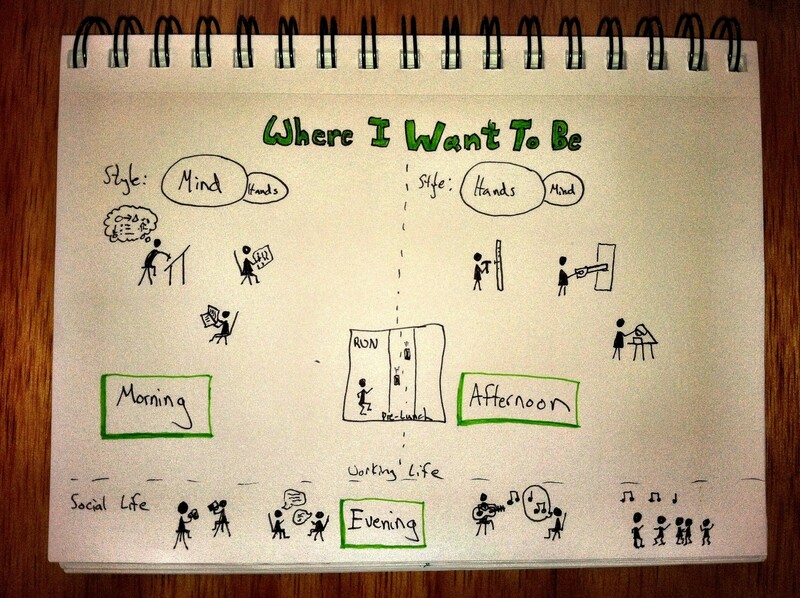 If you’re passionate about making it a reality, check out Dobrowolski’s site, her TEDTalk, and her book: Drawing Solutions: How Visual Goal Setting Will Change Your Life.